Quick Question: Is There An Intake Manifold That's Scarier-Looking Than This One? When it comes to sucking fuel and air into an engine, there’s nothing I love more than a good intake manifold. But that doesn’t mean they’re not occasionally terrifying. Which is what leads me to wonder: is there a scarier-looking intake manifold than the one on the Nissan/Infiniti 4.5-liter V8 engine? 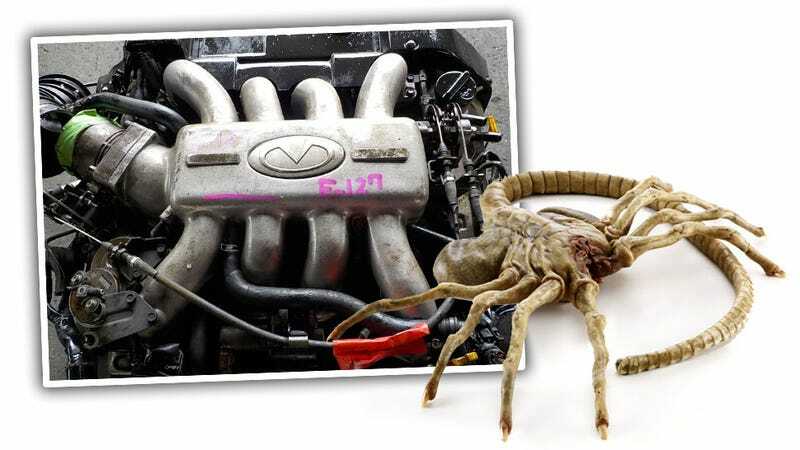 The thing about this one on the VH41DE engine is that it is a dead ringer for one of those facehuggers from Alien. I mean, look at that thing – in a dark spaceship interior, if one of those manifolds came sliding across the floor at you, you’d be a fool not to soil your silver jumpsuit and get the hell out of there. It’s got the right number of legs, and the air intake even mimics that long, snaking tail/ovipositor that’s preparing to snake down your throat to implant you with a chest-bursting baby alien. Anyway, if you can find a more terrifying-looking intake manifold, I sort of want to see it. I mean, I sort of don’t, because I want to get to sleep tonight, but you know what I mean.